FORT WORTH, Texas, May 16, 2017 /PRNewswire/ -- Fort Worth-based EOSERA Inc. is excited to announce that the biotech innovator is launching their earwax dissolving product, Earwax MD with Amazon Exclusives. The product comes in two sizes, a kit that includes a 15mL bottle and rinsing bulb, and a single 15mL bottle only. Amazon Exclusives features products only sold on Amazon.com and the brand's website, and will be the first to carry Earwax MD. Amazon Exclusives features new and innovative items including products featured on the show "Shark Tank." Eosera decided that Amazon.com was the perfect place to sell their first product, Earwax MD. After decades of unsuccessful attempts by other manufacturers, Earwax MD is the healthcare industry's first earwax impaction solution to safely and effectively dissolve wax blockage in a single application. "When I met with Amazon, we decided it would be wonderful to launch with them because they reach all consumers," said Elyse Dickerson, Founder & CEO of Eosera, Inc. "Our earwax solution will help people worldwide and Amazon is the first step. By bringing this novel innovation to market, our goal is to improve the lives of both doctors and patients by saving people time and money." "Instead of having to dig out earwax, audiologists and hearing aid centers can now fit patients for hearing aids in one visit," she said. Earwax MD is the only product on the market today that is supported by scientific efficacy, revealing that Earwax MD is a game changer for the treatment of earwax impaction. Healthcare professionals can visit www.earwaxmd.com for more information, or send an email to info@eosera.com. EOSERA, Inc. is a majority woman-owned biotech company committed to developing products that address underserved medical needs. Eosera's first product, Earwax MD, is a patent-pending topical drop that uses a dual-action technology to dissolve impacted earwax. It is the first topical earwax treatment innovation in over 50 years. Earwax MD is proven to perform in a single treatment, unlike alternatives that require multiple applications over time. 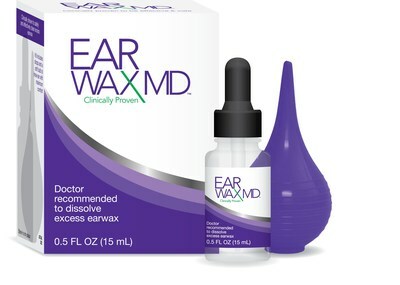 Visit www.earwaxmd.com.